Quill Entertainment Company is an outgrowth of GB Productions and Granville Burgess is one of the founders of this company. It is a 501(c)(3) tax-exempt corporation based in Philadelphia PA, the cradle of American Liberty and an area rich in history, tradition and education. Quill Entertainment uses its proximity to the region's many universities, museums and historical sites as a base for its initial productions, drawing as well on the nearby resources of New York City, New Haven CT, Boston, Washington DC and Virginia. 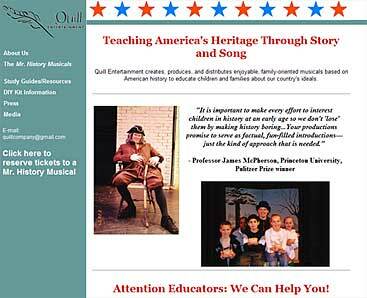 The mission of Quill Entertainment Co. is to create and produce original programming for stage, television, and interactive media, using history to entertain and educate their chosen audience about the core values of America and of mankind - how these values developed in the past, how they affect us today, and how we must carry them forward into the future. Quill Entertainment will be the first entertainment company in the US to focus exclusively on developing history programming for young people across multiple media. Quill Entertainment will produce and release work in partnership with local museums, universities, regional historical and tourism groups, and television broadcasters, to build on their established audiences, visibility and reputations.